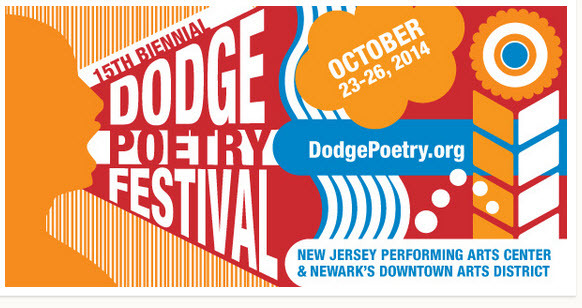 For the third time, the largest poetry event in North America comes to New Jersey’s largest city when the fifteenth biennial Geraldine R. Dodge Poetry Festival returns to Newark from Thursday October 23rd through Sunday October 26th, 2014. For four days Newark’s vibrant downtown Arts District will be transformed into a poetry village featuring some of our most celebrated, diverse and vibrant poets and spoken word artists. • Poets on Poetry: Festival Poets read and discuss some of the poems and poets that have mattered to them. • Poetry Samplers feature over two dozen poets giving brief readings introduce a wide range of the poets appearing at the Festival. • Conversations: Intimate groups of Festival Poets discuss enduring themes, topical issues and emerging questions evoked by poetry. • Festival Poet Readings feature a dynamic and diverse group of regional and national poets. • Evening Main Stage Readings feature some of the most celebrated poets writing and performing today. • Poetry and music explorations and collaborations featuring poets, musicians and dancers from a wide range of genres. • Special events focusing on themed readings, like “Another Kind of Courage,” a reading by war veterans and their families. Tickets on sale now through NJ PAC!